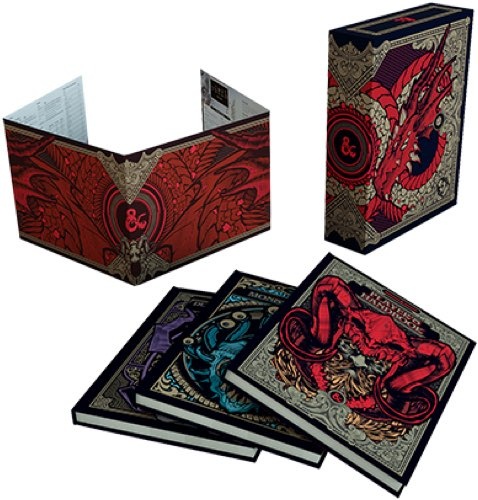 The Dungeons & Dragons Core Rulebooks Gift Set includes a copy of all three core rulebooks—the Player’s Handbook, Dungeon Master’s Guide, and Monster Manual, plus a Dungeon Master’s Screen. Everything a gamer needs to create and play adventures in the world’s greatest roleplaying game.Whether you’re starting an adventure or looking for the ultimate gift for a fan, this set of core rulebooks contains the most up-to-date version of the Dungeons & Dragons roleplaying game. A Dungeon Master’s Screen is included to help keep the game going.